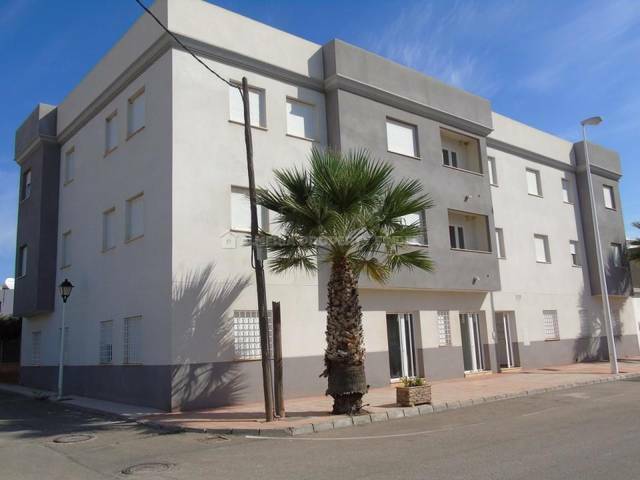 3 Bed/3 Bath (2 En-Suite) Large 145m2 Apartment with private balcony on the edge of the village of Arboleas, Almeria. Offered very realistically at 94000 Euro for quick sale. Enter from roadside through secure door with intercom and 4 marble steps down to the apartment. Hallway leads to the Master bedroom on the right with en-suite bathroom inc. corner bath, fitted wardrobes. Fully fitted kitchen with ample cupboard space above and below granite worktops. Rear door leads to small courtyard, ideal for laundry. Double bedroom with full en-suite inc. normal bath and fitted wardrobes, hallway leads to shower room and into large lounge with dining area and second double bedroom with Juliet balcony. The central lounge is spacious with double doors onto the front balcony with space for alfresco dining or whiling away the hours and taking in the views across the rambla, lemon groves and hills beyond. This apartment is in a much sought after block and ideal as a turnkey property or for those andldquo;downsizersandrdquo; looking for something closer and within walking distance to the village of Arboleas and all its local amenities inc. new medical centre, pharmacy,gym, communal pool, bakery, bank,and popular Saturday street market. This apartment is high spec, air conditioned, ready to move in to and is very realistically priced at 94000 Euro. Viewings are highly recommended.